Tax is not included in the room rates. 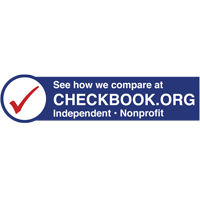 Current tax rate is 14%, and is subject to change without notice. Parking rates are subject to change without notice. Please note: Additional fees may apply for triple and quad occupancy. Globetrotter is the official and ONLY housing agent for METALCON. Find a modern city oasis in the heart of Pittsburgh at The Westin Convention Center. Brimming with smart style and sophistication, our hotel provides travelers with all the tools they need to enjoy a relaxing and productive stay in the Steel City. 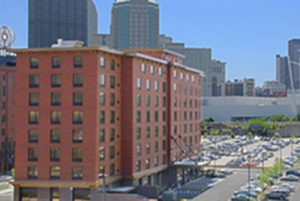 It begins with our impeccable downtown location; ideal for business guests, the David L. Lawrence Convention Center is directly connected to our hotel, while nearby attractions like PNC Park and Heinz Field are only moments away. Retreat into our spacious, modern guestrooms, all of which feature intuitive details like complimentary high-speed Wi-Fi. Modern comfort food and award-winning burgers are on the menu at Bill’s Bar and Burger, while Penn City Grille showcases vibrant, nourishing breakfasts. Find your balance in our WestinWORKOUT® Fitness Studio. Book your stay at the Courtyard Pittsburgh Downtown and experience a mix of rich Pittsburgh history and outstanding service and amenities. 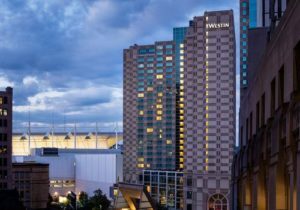 Our award winning hotel is located in the cultural district, just minutes from the David L. Lawrence Convention Center and surrounded by the area’s top attractions. Looking for hotels near PNC Park or Heinz Field? We are conveniently located less than 2 miles from both stadiums. Renovated from 4 historic buildings our downtown Pittsburgh hotel accommodations exude style and comfort with large work areas, plush bedding and free Wi-Fi. Guests can enjoy an on-site breakfast with healthy and made to order selections from The Bistro or indulge in fine wine & cocktails from one of the many nearby restaurants. Our expert event planners will ensure your next meeting or special occasion is a success in one of our 3 flexible event spaces. Surrounded by the best of Pittsburgh, explore this exciting city from our Downtown hotel! Experience the distinctive ambiance of our Embassy Suites by Hilton Pittsburgh Downtown hotel situated on the top floors of the historic Henry W. Oliver building. 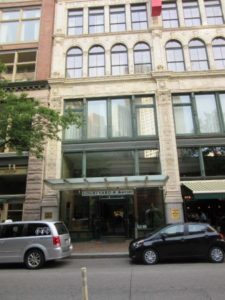 The building was designated a Historical Landmark in 1974 by the Pittsburgh History and Landmarks Foundation and is located in the central business district, within walking distance to local attractions, restaurants and shopping – an ideal location for business and leisure travelers. Enjoy proximity to PNC Park, Heinz Field and PPG Paints Arena. Visit the nearby Senator John Heinz History Museum or attend an exhibition at the David L. Lawrence Convention Center, just blocks from our hotel. The University of Pittsburgh, Carnegie Mellon University and the Carnegie Museums of Pittsburgh are all just a short drive from our hotel. Our all-suite hotel features a stunning lobby with soaring ceilings and beautiful views of the downtown skyline. Our stylish suites include a separate living area, desk, mini-refrigerator, microwave and coffeemaker. Free made-to-order breakfast is included with your stay. Unwind in the indoor heated pool or work out in our modern fitness center. Our hotel in downtown Pittsburgh offers a business center and meeting space for up to 150 guests in a banquet-style setting. Pre-function space, A/V equipment and specialized wedding or dietary menus are also available. Hampton Inn & Suites Pittsburgh-Downtown is centrally located in Pittsburgh’s historic strip district, home to open food markets, street vendors and unique shops. The hotel is across the street from the Senator John Heinz History Center, by the University of Pittsburgh and only a block from the David L. Lawrence Convention Center. Catch the Pittsburgh Steelers at Heinz Field or the Pittsburgh Pirates at PNC Park, both within walking distance. The hotel offers easy access to the Medical District. Explore world-class museums and attractions at the North Shore, just minutes from our hotel. Enjoy free parking, free WiFi, Hampton’s free, hot breakfast® and a comfy guest room or suite with a clean and fresh Hampton bed®. We offer a 24-hour business center with free printing and two fully equipped meeting rooms for up to 55 people. With a fitness center, indoor pool and hot tub, our hotel makes it easier to have some fun and maintain your exercise regimen. Savor sophistication at Omni William Penn Hotel. 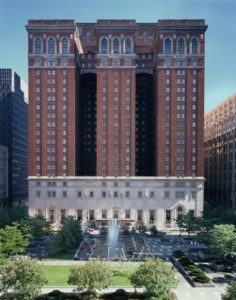 Since opening its doors in 1916, the hotel has played a starring role in the city of Pittsburgh, hosting movie stars, politicians, heads of state and leaders of business and industry. A multi-million-dollar renovation enhanced the beauty of our luxury hotel to ensure that generations to come will enjoy the outstanding service, comfortable accommodations, elegant event venues and award-winning cuisine that have defined us for decades. We invite you to be a part of our history when you reserve our guest rooms and suites any time of year. Omni William Penn Hotel is just 18 miles from Pittsburgh International Airport and 11 miles from Allegheny County Airport. 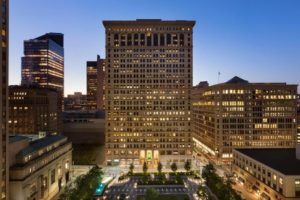 Welcome to the historic Renaissance Pittsburgh Hotel located in downtown, an inspirational landmark among Pittsburgh hotels that balances the classic architecture of the Fulton Building with a sleek, modern design for today’s traveler. 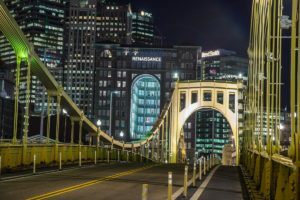 With a coveted riverfront location in the heart of downtown’s Cultural District, we are within walking distance of PNC Park, Andy Warhol Museum and the city’s celebrated performing arts theaters. Discover the artistic elegance, luxurious accommodations and signature service at one of the most historic hotels in Pittsburgh. It’s an experience unlike anywhere else in the Steel City.